The Global Investor Group is a community of ordinary people who are committed to making an extraordinary difference.The Hunger Project Australia is passionate about ending hunger by transforming communities and empowering people to take ownership of change – both in rural villages across Africa, India and Bangladesh and here in Australia. Hunger can end, but it will take our investment and leadership. 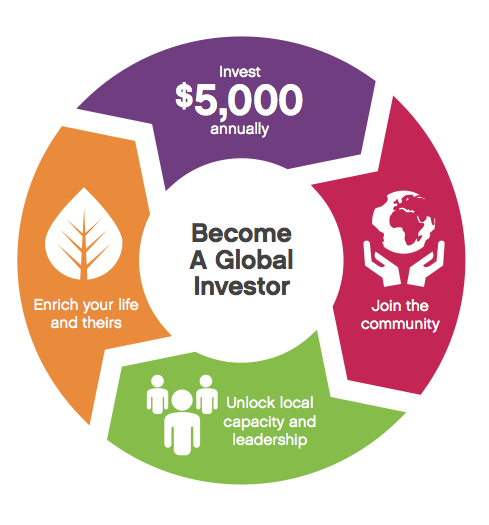 By becoming a Global Investor, you are committing your money with conscious and deliberate action – matching your resources with the leadership of our village partners. Together, we are making a meaningful difference that will last generations. Global Investors invest a minimum of $5,000 annually. Investing at this level not only impacts the hungry, it has a profound impact on the investor. In giving, you will receive so much in return. The Hunger Project Australia is passionate about engaging our community in a meaningful way that has us connect, stretch and make a difference. As a member of the Global Investor Group you are joining a community of like-minded individuals, families and companies who believe that we can end hunger in our generation and who are taking action with their money to bring this about. You will have opportunities to come together, to be updated on our work, and to connect with other extraordinary and inspiring people from the Global Investor Community. We are building a movement of Global Citizens who stand shoulder to shoulder with the most impoverished people on our planet. Together, we are ending hunger. To find out more about the Global Investor Group, please contact The Hunger Project Australia office.